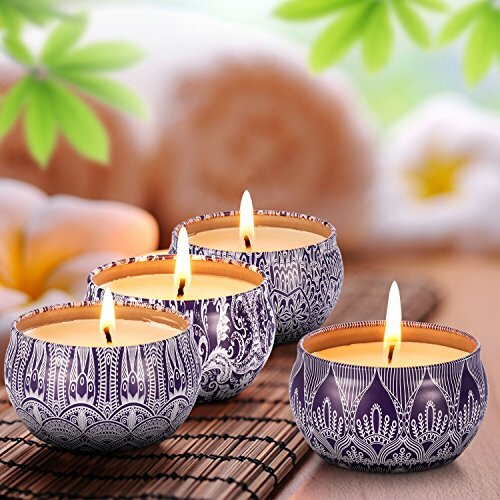 Scented Candles Blue & White Gift Set - 4 Pack Fragrance Soy Wax Candle with Aromatherapy Essential Oils - Include (Lily & Green Tea & Lilac Blossoms & Ginger Flower) - Gift for Valentine's Day by Uwax at Passion Missions. MPN: 4335046179. Hurry! Limited time offer. Offer valid only while supplies last. CAUTION: Burning it no longer than two hours each time. Take care not to let these goods be burned on! Place it on a heat resistant surface only. Burning it no longer than two hours each time. Take care not to let these goods be burned on! Place it on a heat resistant surface only. NEVER near anything that can catch fire. Stuck on gift ideas for your special one? Need something for the folks? Packaged in an immaculately designed box, this four candle set is the ideal present for birthdays, Christmas, anniversaries, Mother¡¯s & Father¡¯s Days, or other holidays. Strike a match and light the candle to enjoy 12-15 hours of inviting aromas and a soft, welcoming glow. Each candle measures a generous 2.6 x 1.8 inches for use wherever you like. ★【Superior Quality】- High quality, eco-friendly, biodegradable, clean burn nicely. ★【Great Value】- Pack of four candles, each candle is 2.2 Oz and has a 12 - 15 hour burn time. Size: diameter 1.8" x 2.6 H.
★【Gift Box】 - This special limited edition candle comes in a light box beautifully designed, which features a unique and stylish floral pattern. ★【Portable Traving Cans】- The scented candle comes with a convenient lightweight tin that allows for easy packing and transportation. If you have any questions about this product by Uwax, contact us by completing and submitting the form below. If you are looking for a specif part number, please include it with your message.